H.E. Nassir Abdulaziz Al-Nasser, Permanent Representative of the State of Qatar to the United Nations, addresses the General Assembly following his election as the President of the Assembly's sixty-sixth session. 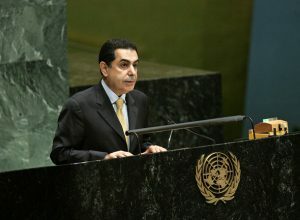 The General Assembly this afternoon elected Nassir Abdulaziz Al-Nasser, the Permanent Representative of Qatar to the United Nations, as President of its sixty-sixth session. Elected in separate meetings were the Chairs and other Bureau members of the Assemblyâ€™s six Main Committees, in addition to 20 Vice-Presidents of the Assembly plenary. Following his election by acclamation, the incoming President said that during the sixty-sixth session, the world would face enormous political, social, economic and environmental challenges. Not a month had passed without news of a natural or manmade disaster and the subsequent food, security, health and education crises. Further, people still were living under occupation, while other crucial questions of human rights, sustainable development and poverty eradication, among many others, persisted. 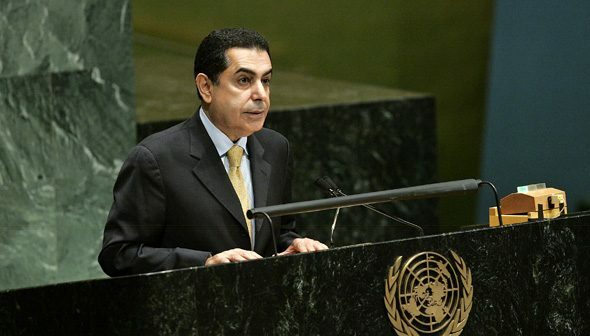 He said he had proposed a high-level debate be held at the opening of the sixty-sixth session under the theme of â€œthe role of mediation in the settlement of disputes by peaceful meansâ€, which he believed would deepen cooperation on an issue that was at the heart of the United Nations work. That issue affected the United Nations existence. Indeed, the integrity, legitimacy, survival and effectiveness of the Organization depended on Member States. He went on to say that respect for diversity and pluralism â€” regardless of religion, race or ethnicity â€” was a principle on which the United Nations was founded, and he pledged to undertake his role as President in a spirit of constructive cooperation and mutual respect. The road to success must be founded on partnership, as well as a deep sense of justice and responsibility. 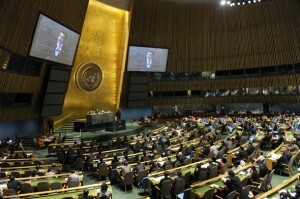 Wide view of the General Assembly Hall, as Nassir Abdulaziz Al-Nasser, Permanent Representative of the State of Qatar to the United Nations, addresses delegates following his election as the President of the Assembly's sixty-sixth session. â€œI will not limit my presidency to presiding over meetings or reading statements,â€ he declared. 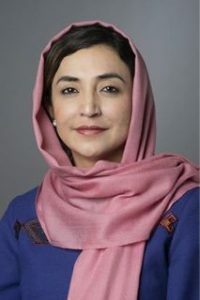 Rather, he would focus on strengthening the Assemblyâ€™s role and its cooperation with the various United Nations organs and specialized agencies, as well as other international and regional organizations. He aspired to act as a bridge among developed, developing and least developed countries, and would focus on building consensus, especially on such issues as armed conflict, the rights of peoples to self-determination, hunger, poverty, terrorism and climate change. Congratulating Mr. Al-Nasser, Secretary-General Ban Ki-moon said the Ambassador already had ably served as President of the Security Council, Chairman of the Fourth Committee and Chairman of the Group of 77 developing countries and China. He also had personally led the way on an issue of great concern to him and his wife: the worldâ€™s response to autism. Qatar itself had become an increasingly important actor in the international arena, notably in facilitating the Darfur peace talks, and he was grateful for that wide-ranging support. 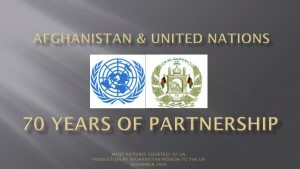 â€œIn more than 12 years at the United Nations, you have always appreciated the special role of the General Assembly,â€ Mr. Ban said. Long before he had become Secretary-General, he had had close contacts with the Assembly, and he knew from personal experience what the 192-member body could accomplish. â€œI understand your office needs support to get the job doneâ€, he said, emphasizing that he would work to keep the partnership with the Secretariat strong. Also congratulating the President-elect, Joseph Deiss (Switzerland), President of the sixty-fifth session, said that Mr. Al-Nasser, in 12 years of service, had won the respect and esteem of his colleagues. His history at the United Nations was known through a long practice of multilateral diplomacy. The renewal yesterday of the Secretary-Generalâ€™s second mandate offered a sign of the close cooperation between the Secretariat and Members States for a United Nations that was strong and credible on the international stage. Indeed, several important reforms were under way, he said, and it would be the President-electâ€™s responsibility to continue that work. In those efforts, Mr. Al-Nasser could count on his Cabinet to ensure an efficient transition, especially with regard to the Assemblyâ€™s revitalization. He offered Mr. Alâ€‘Nasser a manual, prepared with the support of the Swiss Mission to the United Nations, as a contribution to institutional memory, explaining that, as Presidents were elected annually, it was important to ensure that the knowledge was passed on. The manual tried to respond to all questions about the Assemblyâ€™s procedure and functioning. â€œI wish you every success in the passionate undertaking of President of the General Assembly,â€ he said. Also taking the floor to congratulate the President-elect on behalf of their respective regional groups were the representatives of Senegal (African States), Kuwait (Asian States), Republic of Moldova (Eastern European States), Bolivia (Latin American and Caribbean States), Israel (Western European and Other States), and the United States (on behalf of the host country). Also this afternoon,the Secretary-General drew lots, in accordance with tradition, to determine which Member State would occupy the first seat in the General Assembly Hall during the next session. Turkmenistan was picked to occupy that seat and would be followed in English alphabetical order by all other countries, with the same order observed in the Main Committees. In separate meetings the six Main Committees of the General Assembly elected Chairs and other officers. Jarmo Viinanen ( Finland) was elected Chair of the First Committee (Disarmament and International Security), with Mohammad Al-Mutairi ( Kuwait) as Vice-Chair and Archil Gheghechkori (Georgia) as Rapporteur. Abulkalam Abdul Momen ( Bangladesh) was elected Chair of the Second Committee (Economic and Financial), with Philippe Donckel ( Luxembourg), Raymond Harold Landveld ( Suriname) and Denis Zdorov ( Belarus) as Vice-Chairs. Hussein Haniff ( Malaysia) was elected as Chair of the Third Committee (Social, Humanitarian and Cultural), with Donnette Critchlow ( Guyana), Carolina Popovici ( Republic of Moldova) and Luca Zelioli ( Italy) as Vice-Chairs. Simona-Mirela Miculescu ( Romania) was elected Chair of the Fourth Committee (Special Political and Decolonization), with Jim Kelly ( Ireland) and MarÃ­a-Waleska Vivas-Mendoza ( Venezuela) elected as Vice-Chairs. HernÃ¡n Salinas Burgos ( Chile) was elected Chair of the Sixth Committee (Legal), with Mattanee Kaewpanya ( Thailand), Petr VÃ¡lek ( Czech Republic) and Ceta Noland ( Netherlands) as Vice-Chairs, and Jacqueline K. Moseti ( Kenya) as Rapporteur. The Vice-Presidents for the sixty-sixth session will be: Benin, Chad, Liberia, Malawi and Morocco from the African States; Fiji, Iran, Kuwait and Republic of Korea from the Asian States; Hungary from the Eastern European States; Bolivia, Haiti and Uruguay from the Latin American and Caribbean States; and Australia and Austria from the Western European and Other States. The five permanent members of the Security Council (China, France, Russian Federation, United Kingdom and the United States) also serve as Vice-Presidents. The President informed delegates that the election of an additional Vice-President from among the African States would take place at a later date.